Please note that the prices above relate only to students booking directly through Sanctuary Students. For bookings through UCLan, please refer to the UCLan website. Our booking fee is just £1! Once you have accepted our offer, we will take a non-refundable payment from your account. Once you have booked, you can choose the tenancy length to best suit you to help make payments more affordable and easier to manage. You can choose to pay in 1, 2, 3 or 7 instalments. If you have a 50 weeks contract, you also have the option of 4 or 11 instalments. When the time comes to move out, we will inspect the property and you may be liable to pay additional charges if we find any damage. You will need to remember to pay your rent on time, however if you are struggling to make payments, please contact us as soon as possible by calling 0870 600 4777 so we can help. These rooms are great value and come fully furnished with a single bed and shared bathroom facilities. If you want a little more privacy, these rooms are ideal. The fully furnished room has a single bed and private bathroom. Treat yourself to a little luxury in this fully furnished room, with a double bed and a private bathroom. If you need a little more space, these rooms are perfect. The fully furnished room has a double bed, private bathroom and extra floor space. Lets play! Sky TV, games machines and table sports are available in the common room. On-site laundry facilities provided by Circuit Laundry. Yes that’s right, you could have a whole double bed all to yourself! Our student accommodation is home to 496 students living in standard, double and en-suite bedrooms. 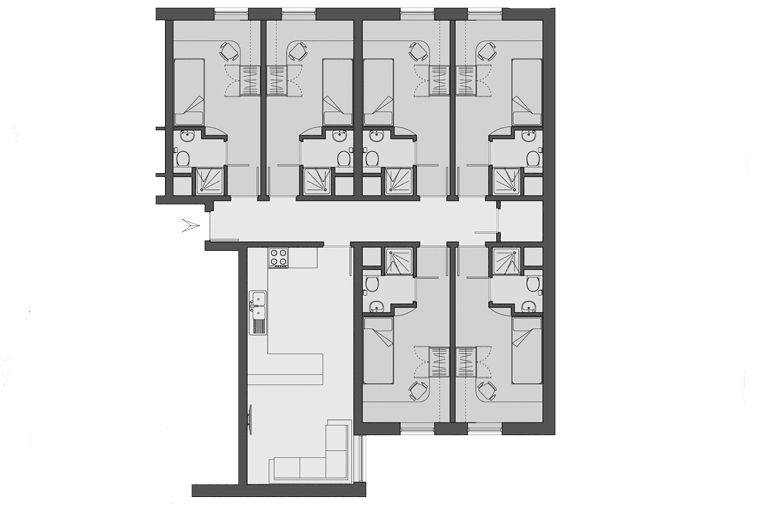 Each flat has a communal kitchen and living space and depending on the style of room you decide to book can depend on how many people you live with in your flat. Our communal facilities are there for you to make the most of during your stay including the free on-site gym, laundry room and building-wide WiFi. There’s also a common room where you and your friends can relax, with games machines, pool table, football table and a large flat-screen TV with Sky. Our team are available during office hours should you need help or have any questions. Our great value accommodation means you have everything provided for day-to-day life without paying more than you need to. Living so close to the UCLan campus and Preston’s lively city centre, you can really make the most of student life here, making it the perfect place to call home. See what life at Moor Lane Halls is really like in this short tour of the accomodation filmed by our students. You want to make the most of study time as well as free time and Moor Lane Halls can help you do just that. 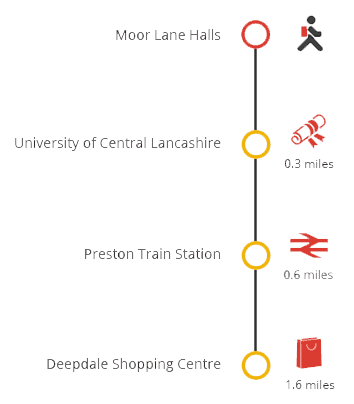 With UCLan university just half a mile away and a number of popular pubs and clubs opposite, you can choose how much or how little you want to be in the middle of all the action. UCLan Sports Arena is perfect for those of you who like to keep active. There’s a variety of sports teams welcoming students just a short walk away. Maybe, supporting the local football team is more your thing, if so, you and your friends can easily jump on the local bus to Deepdale Football Stadium, home to Preston North F.C. Whether you are treating yourself or in need of some essentials, Preston’s high street is just a few minutes away with all the shops and local amenities you need. For your everyday bits and bobs, there is a convenience store just across the road. Getting out and about in Preston is easy with its great transport links, making it easy to get around by bus and train. To find out more about the city, check out our Preston City Guide. With your email address being the best and easiest way for us to get in touch with you, we will email your e-contact as well as updates and arrival information. We don’t want you to miss out on anything so don’t forget to let us know if you change your email address. We understand an internet connection is important for both your academic and personal needs. That’s why we have building-wide WiFi and Ethernet broadband services available, included within your rent payments. Here, you’ll have a reliable and secure internet connection day and night so you can email, download and stream to your hearts content. The internet package we provide includes a super-fast symmetrical 50Mbs Ethernet broadband service as well as a 10Mbs building-wide WiFi service. So you can enjoy our seamless roaming coverage, that’s fast and reliable, giving an uninterrupted service. For more details of what’s on offer visit the Glide website. For useful video user guides and translated user guides, please visit the support centre. Any extra services you may find useful such as security, online backup and mobile services are available at an additional charge. You will find us at the reception desk at the front of the building. However, if you are planning on arriving out-of-hours (between 5pm and 9am) please let us know in advance so we can leave your keys with the 24-hour security guard. If you do not let us know, unfortunately your keys will be locked away securely overnight. Bring some photographic ID with you such as a driving license or passport. We are more than happy for you to arrange for someone to collect your keys on your behalf, but we will need written permission from you. You will need to collect your keys before you start unloading your car. Once you have your keys, you can use the small car park for 20 minutes while you unload your things. However, please bear in mind we will have lots of students wanting to do the same, so please use a local car park after that. *Students allocated a room in flats 29 - 50 will have a kettle provided for them. We hope you are as excited as we are about your stay with us and wont need to cancel your room…but we know unexpected things can happen from time to time. You can cancel at any point during this period, but there will be a reasonable administration charge. During this time you will only be able to cancel your agreement if a suitable replacement is found to take your place. The search for a suitable replacement can either be done by yourself or we can do it for you. If you do decide to ask us to do this, we will only be able to allocate someone once all our other rooms have been let. Whichever option you choose, there will be a reasonable administration charge. Please remember, if no suitable replacement is found, you will still be responsible for payment of the rent in full, even if you do not move into the property. Please let us know as soon as possible if you decide to cancel the agreement. Any written cancellations and refunds will need to be made to your on-site team. Refunds are normally processed within 14 working days. We hope we’ve covered all your questions about Moor Lane Halls, but if you feel anything has been left unanswered, take a look at our FAQs page, some of them may have been answered here, for anything else please get in touch with us or click ‘Chat to us’ at the bottom of the page. Your handbook is full of essential information you will need to know when you move in with us. You will receive a hard copy on the day you move in, but feel free to take a look through the below to familiarise yourself with everything you need to know in advance. The Sample Tenancy Agreement (PDF 482KB) gives you an idea of the terms and conditions of your contract with us. Your full contract will be available to download from the university website once you have accepted your agreement. You may want to bring a TV with you for your room and please feel free to do so, but please remember if you will be watching live TV or receive or record live TV programs, you will need a TV license. This applies to all other devices you may watch TV on too such as laptops and iPads. You won’t be covered on your parents’ license or our licenses as they over cover the TV’s we provide in common rooms and lounge areas. You now also need a TV license to watch BBC iPlayer. To find out more, look at payment plans or to buy your license, visit the TV Licensing website. The authorities do recognise that most students do not need the final three months of a license as you leave our accommodation during the summer, so you may be able to receive a refund for this period if you don’t need it again before it expires. Remember, if you do not have a TV license and you receive or record live TV, you could face prosecution from the TV Licensing Authority. We know washing your clothes can be a boring chore, so we use Circuit Laundry Systems at Moor Lane Halls to make it as quick and easy as possible. All you need to do is purchase a top-up card to pay for your washing and drying in advance either online or using one of the on-site machines. Or why not download the Circuit app, you can top your card up straight from your phone making it even quicker and easier. Ask our team about getting a top-up card and there are plenty of ​​​​​​Circuit’s ‘how to use’ videos for more information. All your possessions, desktop and laptop equipment are insured for theft, fire, flood, burst pipes, storm, vandalism, explosion and lightning. Cover applies within your accommodation, in temporary residence and in transit at the beginning and end of each term. This is just a summary and does not describe all the terms and conditions of the policy and does not form the contract between you and the insurance provider, so please take the time to read the policy wording thoroughly on the Cover4Students website to make sure you fully understand the cover provided. You can also read the full Sanctuary Students Insurance Policy (PDF 783KB).